Twenty-five years in some careers might lead to a tangible conclusion, but in the world of particle physics, it represents only the first generation of an experiment where “you’re now an adult, and it’s time to reconfigure yourself a little,” according to Randal Ruchti, professor of particle physics. 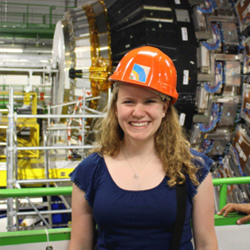 That is the case with one experiment being conducted at the Large Hadron Collider (LHC) at the European Organization for Nuclear Research (CERN)—an experiment where Notre Dame researchers have made valuable contributions since its inception. In June 2017, Notre Dame professors celebrated 25 years of work on the Compact Muon Solenoid (CMS) detector with about 500 others at the CERN campus in Geneva, Switzerland. 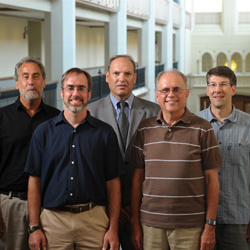 Notre Dame’s High Energy Physics group of experimental physicists consists of professors Michael Hildreth, Colin Jessop, Ruchti, and Mitchell Wayne, as well as associate professor Kevin Lannon, research associate professor Nancy Marinelli, and many students and postdoctoral researchers. Five years after one of the most exciting physics discoveries in modern times was confirmed at CERN—the Higgs boson, a particle that helps explain how other particles get their mass and the one at the center of what is known as the Standard Model of Particle Physics—physicists continue to collect more data to further understand how the universe works. Some theoretical physicists feel pressure to detect more particles than the Higgs, which hasn’t happened yet. But Ruchti and other experimental physicists at Notre Dame are taking the long view, because new discoveries simply take time, they say. One theory, supersymmetry (known as SUSY), has remained elusive despite the immense power of the LHC. The LHC is the world’s largest particle accelerator, housed in an underground, 17-mile circumference tunnel. Electromagnetic fields propel protons to 99.999999 percent of the speed of light before colliding head-on. When the protons collide, they explode into many different particles smaller than atoms. 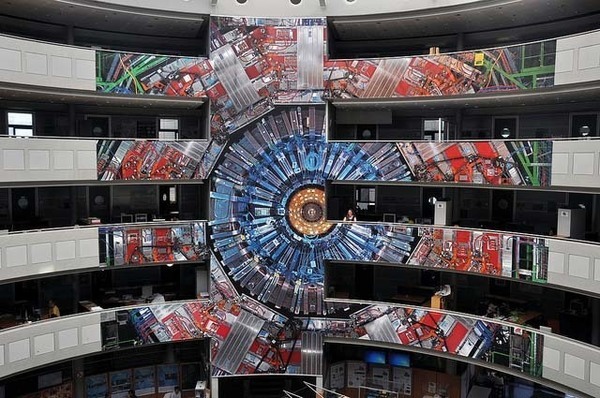 The CMS and a sister detector called the ATLAS confirmed the existence of the Higgs boson in 2012, resulting in the 2013 Nobel Prize in Physics for the theoretical physicists who predicted it, Peter Higgs and Francois Englert. However, the detectors have not discovered other particles that would confirm SUSY, the theory that all particles discovered so far have corresponding partner particles. Ruchti, a photo of an illustration of the CMS detector in his hand, points out its different-colored rings where he and other Notre Dame experimental physicists and students have made major contributions. Optical techniques are one of the University’s specialties within the CMS experiment, and the Notre Dame team is now in the process of helping with upgrades to the optics in the detector. Those upgrades will help further the search for particles that can prove SUSY—or not. Doctoral students Charles Mueller and Michael Planer, both of whom spent years at CERN, say physicists are still getting closer to the truth of how the universe was formed even if SUSY ultimately isn’t uncovered as part of the experiments at CERN. For Planer, not finding all the answers quickly means the next generation of researchers has time to find them. Originally published by Deanna Csomo McCool at science.nd.edu on September 14, 2017.